Google books Downloader is a free program provided by Google that allows you to download any books, magazines, and documents which is available in “Full view” from Google Books. You can also download these books using the download links that they feature on the right on the web page but using Google Books Downloader you can download books directly from Google in PDF format which makes your reading a lot easier. 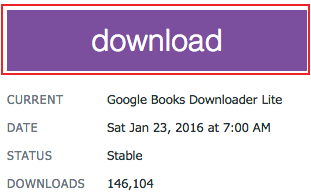 How to download books using Google Books Downloader? The first step here obviously is installing Google Books Downloader if you don’t have one yet. For that, enter https://googlebookdownloader.codeplex.com in your web browser. Click on the purple “download” button at the right side of the webpage. This will begin your download and installation process. You might be prompted to accept permissions to finish the process. Now, open any web browser and enter books.google.com. Enter the book or magazine you want to download and click on the “Search Books” button. You can click on the blue “My library” link at the bottom. Click on ”Advanced book search” from the dropdown “Settings” gear icon. You can directly enter https://books.google.com/advanced_book_search in your web browser. You’ll be directed to “Advanced Book Search” page where you can optimize your search using a number of options. For instance, click on the circle next to “Full view” so that you can easily search for books that are available for download on Google books. This will save a lot of your time rather than randomly searching for books which might not be available for download in “Full view”. Now, enter the book’s name which you want to download in the provided field and click on the “Google search” icon. Then, select the “Book” that you need and copy the page URL. Paste the URL in the given field in the “Google Book URL” in Google Books Downloader. Select the format in which you want to download. Select “PDF” format as it is the most convenient format to read books. Select the books resolution default 800. Click on the “Start” icon and your book download will start which might take a while. Click on “Done” to finish the process. You can also select the destination where you want to save your book. By default it will be saved in your desktop.